Banner advertising is available on the top or right side of each of our 80 chapters. Cost: $4,000 per year for top or right side banner for our three highest traffic chapters: Stains & molecular markers, Soft tissue and Skin nonmelanocytic tumors. These ads are $2,000 for all other chapters. Specifications: banners must be in JPG, PNG or static GIF format. Top banners are 728 x 90 pixels. Right side banner is 300 x 250. You can provide your own tracking code within the link. 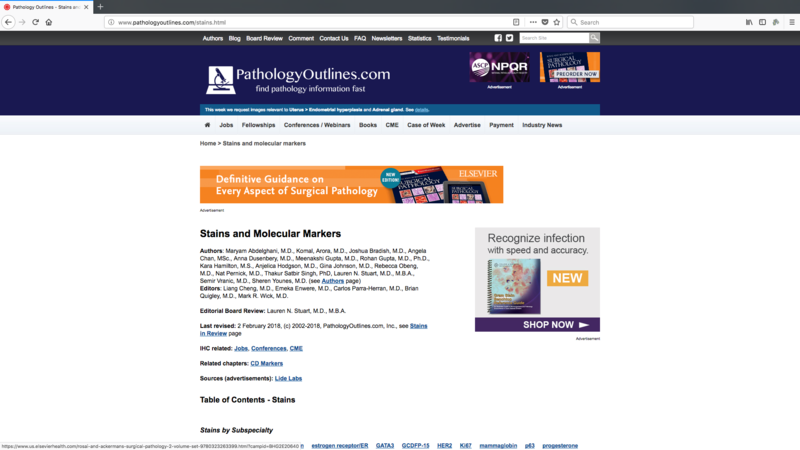 Sample: see Stains & molecular markers chapter for an example of top and right sided banners. We can provide you with page views for any chapter, which includes the main chapter page and the interior pages.